Sustainability of evidence-based programs (EBPs) in community settings is a critical goal for prevention science. Failure to sustain programs is common and to a large degree stems from a lack of understanding of context specific mechanisms that can support continued delivery within a given setting; partnerships with stakeholders in the setting are key for identifying these mechanisms. 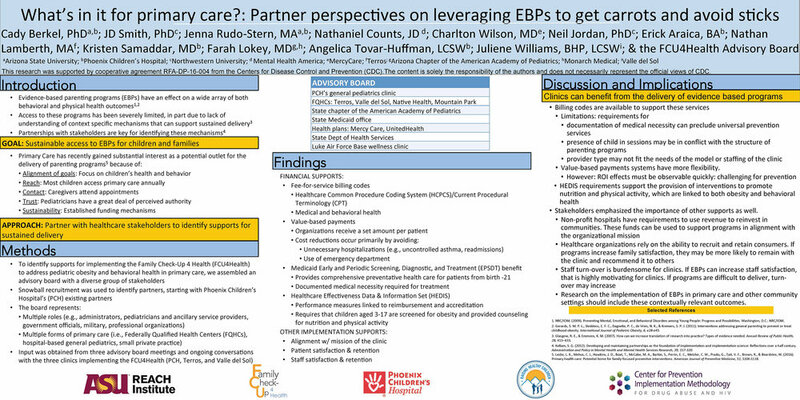 Significant attention is arising around the potential of primary care for the delivery of parenting EBPs. Most children access a primary care provider annually, caregivers are present, and doctors have a high level of perceived authority among parents who look to them for advice on children’s health and behavior problems. Perhaps most compelling is that primary care has sustainable funding mechanisms in place which may be used to support EBPs. A drawback is that primary care depends on a rapid client flow to remain financially solvent, while being required to address a high number of health outcomes and behaviors. We have developed partnerships with providers and payors to embed an adapted parenting EBP (the Family Check-Up 4 Health) in primary care. In this presentation, we will present strategies (see below) identified by our partners as mechanisms that can support the adoption and sustained implementation of this and other EBPs in primary care. Programs that have demonstrated health-focused outcomes that are in alignment with the mission of a delivery setting and address an existing need are more likely to be adopted and sustained. The Healthcare Effectiveness Data and Information Set (HEDIS) is a widely used performance measure for reporting on such indicators as measurement of BMI and counseling for nutrition and physical activity. The majority of health plans, including Medicaid, tie performance on HEDIS measures to reimbursement and states link it to accreditation. Accountable Care Organizations (ACOs), and other provider organization are increasingly receiving payments that are dependent on outcomes and linked to total cost of care. Some providers may receive a set amount per patient. If a program can Increase adherence, uncovered expenses will decrease with fewer admits, ED visits, readmissions, and complications of care. A greater volume of patients can bring in more revenue and minimize risk. A program’s sustainability can be influenced by their ability to increase patient satisfaction with the quality of their care, thereby increasing retention and attracting new patients through word-of-mouth. Medical and Behavioral Health CPT codes can be used to reimburse the delivery of EBPs. However, it is necessary to understand the requirement of the codes (e.g., provider, location, and timeframe) and document accordingly.